.This is the way to go because it is light weight and they come in many colors.Not to mention you get a lot of material for cheap.The banshee is able to move his wings as well as roar and eat fish! She absloutlely loved this costume and said it felt like a giant wearable toy!She recieved so many compliments and had several people take their photos with her.The costume took about 8 weeks of nights and weekends to create but was worth it to see the joy it brought to my little one and others:). 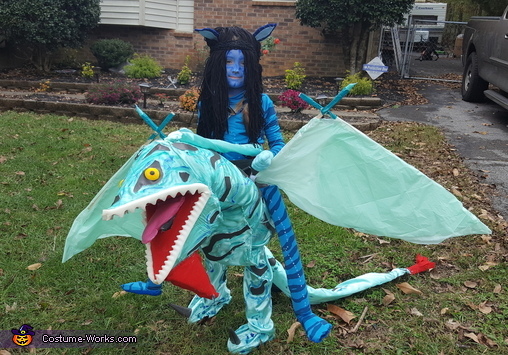 The Avatar / Banshee costume is very creative. The wings work too! Love the outfit! So creative for such a sweet girl! Always the best costumes out of this girl! My daughter loves to repurpose items. She is very creative and encourages my granddaughter to be confident. My granddaughter is very artistic and wears this costume to the T.
Love this costume! She always is wearing the best costumes. That's a great costume. So creative. She always has unique costumes. I've seen this costume, and it is amazing. And my niece absolutely loves it. Shannon really outdoes herself every time she creates a costume.